Purpose: To support an individual project of a scholarly nature, related to Aegean Bronze Age Archaeology, and to be conducted between July 1 of the award year and the following June 30. Preference will be given to candidates whose project requires travel to the Mediterranean for the purpose stated above. AIA fellowship funds may not be used for institutional overhead, institutional administrative recovery costs, or institutional indirect costs. Requirements: Applicants must be citizens or permanent residents of the United States or Canada, or be actively pursuing an advanced degree at a North American College or University. To be eligible, applicants must have been AIA members in good standing for at least two consecutive years (or one year for graduate students) by the application deadline. Please note that all application materials (including references and transcripts) must be received at the AIA by the November 1 deadline. Previous Pomerance Fellows are not eligible. At the conclusion of the fellowship tenure, the recipient must submit a report on the use of the stipend to the Chair of the AIA Fellowships Committee. Tia Sager, Ph.D. candidate in the Department of Art at the University of Toronto, is the 2019 recipient of the Harriet and Leon Pomerance Fellowship. She will use the fellowship funds to further work on her dissertation project, “The Poetics and Politics of Space: a regional analysis of the Cretan Postpalatial built environment”. Ms. Sager proposes to re-evaluate excavated and published built environments dating to the Postpalational Period (c.1450-1200 BCE), in order to offer a new interpretation of their significance in the development of a “Cretan” architectural language. Aikaterini Psimogiannou, Ph.D. candidate at the University of Illinois at Chicago in the Department of Anthropology, is the 2017 recipient of the Harriet and Leon Pomerance Fellowship. Her project, “Mortuary Practices, Ceremonial Feasting and Social Transformation at the Dawn of the Bronze Age on the Greek Mainland,” will create an alternative, holistic model of the transformation of agricultural villages during the Neolithic period to the settlements of the Bronze Age in southern Greece. The project will use ceramic analysis, radiocarbon dating, and other data gathered from the sites of Proskynas and Mitrou to produce both relative and absolute chronologies for the region. The Fellowship will allow Ms. Psimogiannou to travel in Greece, and will assist with radiocarbon dating costs. Pinar Durgun, Ph.D. candidate at the Joukowsky Institute for Archaeology and the Ancient World at Brown University, is the 2016 recipient of the Harriet and Leon Pomerance Fellowship. Her project, “Places of the Dead: The Role of Landscape in the Formation of Mortuary Practices in the Early Bronze Age western Anatolia,” seeks to examine the relationship between the locations of cemeteries, nearby geographical features, and their corresponding settlements in order to understand the role of landscape in the emergence of cemeteries, formation of rituals, and expressions of social identities. Her focus will be on the Early Bronze Age in western Anatolia, which is the period marking the earliest extramural cemeteries. Ms. Durgun, with the assistance of the fellowship, will visit sites and museums throughout western Turkey to collect and analyze spatial data. Kaitlyn Stiles, Ph.D. candidate with the Department of Anthropology at the University of Tennessee, is the 2015 recipient of the Harriet and Leon Pomerance Fellowship. 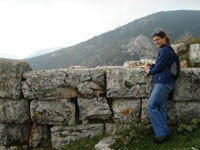 Her doctoral project, “Biosocial Identities in Late Bronze Age Greece”, integrates theory and method from Bronze Age Aegean archaeology, classics, and biological anthropology to examine the biological and social expression of identity in the Late Helladic IIB-IIIB phases (15th to 13th centuries BCE) of central Greece. 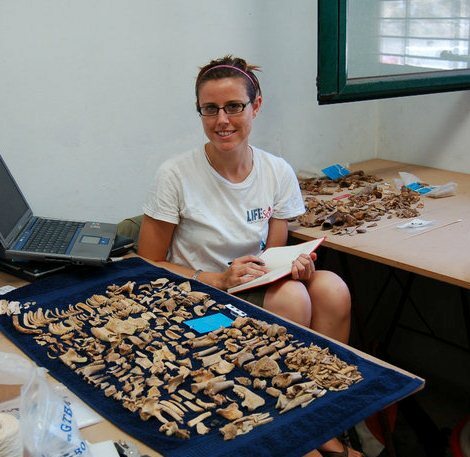 Ms. Stiles will use the Fellowship funds to conduct research on skeletal remains from the Golemi Agios Georgios cemetery in East Lokris, Greece, while based at the Wiener Laboratory of the American School of Classical Studies in Athens. 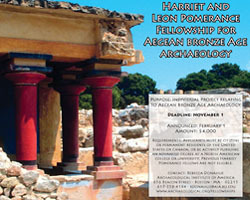 Daniel Fallu, Ph.D. candidate with the Department of Archaeology at Boston University, is the 2014 recipient of the Harriet and Leon Pomerance Fellowship. His project will focus on developing a chronology for changes in climate and sediment at the end of the palatial period in Mycenaean Greece. Optically Stimulated Luminescence and carbon-dating will be used to date torrential and flood deposits overlying Bronze Age ruins in the Lower Town of Mycenae. Isotopic analysis from carbonate formations and charcoal recovered from slope deposits is hoped to reflect changing climatic regimes that helped, along with land use, to drive erosion and landscape change. This work will be combined with the results of systematic micromorphological analysis and form part of a dissertation entitled "Bronze Age landscape degradation in the northern Argolid: a micromorphological investigation of anthropogenic impact on erosion in the environs of Mycenae, Greece." Debra Ann Trusty, Ph.D. candidate with the Classics Department of Florida State University, will be using the Harriet and Leon Pomerance Fellowship to work on her dissertation, “Pots in the Periphery: Ceramic Analysis of Mycenaean Cooking Vessels”. Her project examines various aspects of Bronze Age Greek cooking vessels, to inform our knowledge of the political economy and scale of socio-political control in early states. The study focuses on five Mycenaean sites (the Petsas House at Mycenae, Zygouries, Korakou, Kalamianos, and Stiri), all of which were politically and economically connected to the ruling elite in Mycenae through production and trade connections. Funding for this project will be used to collaborate with scholars in England and Greece and to prepare samples in Greece for chemical analysis in the US. Gypsy Price, Ph.D. candidate with the University of Florida, is the 2012 recipient of the Harriet and Leon Pomerance Fellowship. 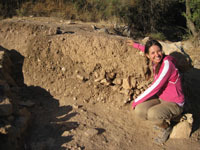 Her project is “Human-Animal Interactions at Petsas House: Isotopic Contributions to Zooarchaeology in Bronze Age Mycenae”, and she will use the fellowship award to return to Greece and continue her analysis of faunal remains recovered from the well at the site, using isotopic analysis to elaborate on more traditional zooarchaeological methods in assessing human-animal interactions. Data gathered from analyses of this faunal collection will help provide a foundation for addressing a number of issues concerning subsistence at Mycenae during the Late Helladic III A2 period (later 14th c. BCE). This work will form part of Ms. Price’s dissertation, “New perspectives in zooarchaeology: isotopic contributions to studies of subsistence economy”. Lynne A. Kvapil, a Ph.D. student with the Program in Aegean Prehistory at the University of Cincinnati, is the recipient of the Harriet and Leon Pomerance Fellowship. Her project is “Urban Farming in the Mycenaean World: The Terraces of Korphos-Kalamianos”, an innovative examination of agricultural terrace walls using spatial, architectural, and survey data to explore agricultural production at the Late Bronze Age harbor site of Korphos-Kalamianos. The terraces are contemporaneous with structures on the site, making them the only known Mycenaean examples in an urban context, and possibly state-organized. Her planned analysis will add to the understanding of agricultural production of a hinterland site during a period of Mycenaean economic expansion. Ms. Kvapil will use the $5,000 fellowship award for travel and fieldwork at Korphos this coming summer. Natalie Abell is a graduate student with the University of Cincinnati, and the Fellowship will support her project of “Reconsidering a Cultural Crossroads: Diachronic Analysis of Island Identity and Aegean Connectivity in Bronze Age Kea”. This research, which comprises a large portion of Ms. Abell’s dissertation, examines ceramic evidence from a site at Ayia Irini in order to address problems of chronology and overseas contact from the Early to Late Bronze Age. The Pomerance Award of $5,000 will be used for travel to Kea and other islands, as well as to Athens for use of the library and archives of the American School of Classical Studies at Athens. 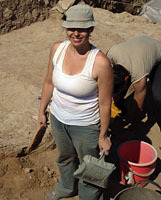 The 2008 recipient of the Harriet and Leon Pomerance Fellowship is Jamie Aprile, Ph.D. student with the Interdepartmental Program in Archaeology, UCLA. Ms. Aprile’s project is “Pylos and Nichoria: A Case Study in Urban/Hinterland Political Economy,” in which she will tackle the complex relationship between the Late Bronze Age Mycenaean Messenia palatial component and its hinterland, Nichoria. Using Kenneth Hirth’s distributional approach, she will investigate her hypotheses that Mycenean sites created extractive economic relationships with their hinterland using patron-client ties, and that these hinterland communities developed independent exchange strategies in order to fulfill these relationships. Restricting her study to Late Helladic IIIA and IIIB periods (c. 1400 – 1200 BCE), Ms. Aprile will examine published and unpublished reports from Pylos and Nichoria, particularly domestic assemblages from Nichoria. Interactions Across the Ionian: 1200-800 B.C. This project compared locations, plans, and ceramics from sites in northwestern Greece, southern Albania, and the Ionian Islands in order to examine ways that these areas interacted during the Late Bronze and Early Iron Age. Making these comparisons was intended to place material excavated from the Albanian sites of Butrint, Cape Styllo, and Kalivo into a broader regional context. Sarah Lima’s research took place in conjunction with a Regular Member Year spent at the American School of Classical Studies at Athens. Using a background of chemistry and archaeology, Andrew Koh is attempting to correlate specific ceramic vessel shapes with their typological function through identification of ancient organic residues. He hopes to identify the function of types of vessels, and provide insight into the function of the surrounding space as well (e.g. food preparation, cultic activity, storage, production, etc.). Continuing work in the field of organic residue identification at this scale, will push the extent to which knowledge can be obtained and preserved from archaeological sites, a cultural resource that is obviously not renewable for any given time period.